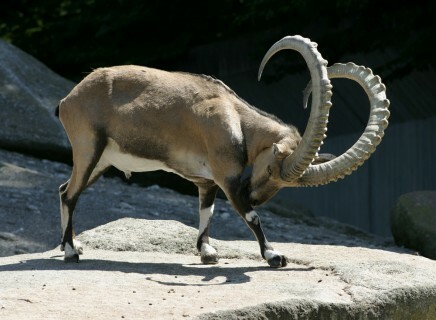 The ibex is similar to the wild goat in terms of the shape of its head, body, and tail. Like the goat, it has scimitar horns that curve backward in a large semi-circle, but with the addition of a series of regularly spaced transverse ridges along the outer edge of the curve. 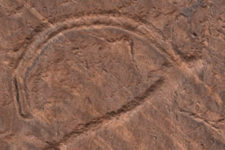 Ancient artists depicted these ridges distinctly on the more realistic panels, however, where a caprine figure is small or crudely portrayed without such horn ridges, it may be impossible to determine whether the image represents an ibex or a wild goat. The pelage of the ibex differs from the wild goat in displaying a brownish-fawn color over the body. However, there is some variation, and the black color of the dorsal crest on the male can extend to the muzzle, chin, and sides of the belly. The ibex prefers a semi-arid to arid environment with a steep mountain terrain below 6,000 feet. It feeds on grasses, bushes and foliage. The ibex has a vast geographic distribution, including the European Alps, montane regions of Russia, Central Asia, Afghanistan, Pakistan, Mongolia, Northwest China, the Arabian Peninsula, and Northeast Africa. 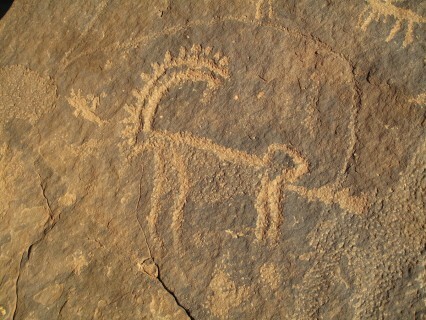 The Nubian ibex ranged across the Arabian Peninsula, Israel, Jordan, Egypt, Sudan, Eritrea, and Ethiopia. It was formerly also in Lebanon and the Syria. Harrison (1968) shows the modern range in the Arabian Peninsula including Tubak, Jiraniyat, gorges near Mada’in Salih, and at Jebel Shammar, near Ha’il. 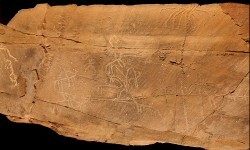 It is poorly known in Central Saudi Arabia, but it has been reported at Jebel Tuwaig, near Riyadh, as well as in the south near Najran. 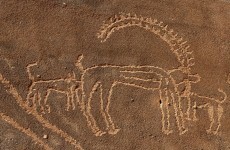 Although it lives in one of the least hospitable terrains on Earth, the largest threat to the ibex is hunting by humans. 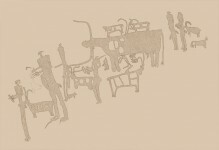 The Neolithic hunting scenes demonstrate that this practice has existed for millennia. 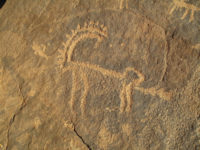 According to Hoeck (1952), the ibex symbolized the Moon God during the reign of the Queen of Sheba. 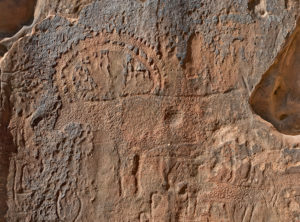 At Marih, a capitol carved with ibex heads was found in the temple of the Moon God. In the Hadramaut, the tradition of placing ibex horns on the cornices of roofs continues today (Harrison 1968: 335).